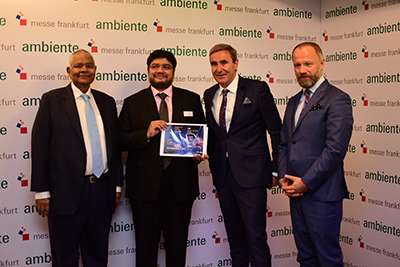 Mr. Stephan Kurzawski – Senior Vice President Consumer Goods and Board Member Messe Frankfurt Group along with Mr. Erdmann Kilian – Director Marketing Communications visited Colombo and at a press conference spoke about the trade fair Ambiente. Mr. Kurzawski said that Ambiente is held every year in Frankfurt, Germany in February and deals with consumer items and where business and creativity come together. The fair is divided into areas of Living, Giving, Dining which offers visitors a clear guide on the products available as there are 4376 exhibitors from 88 countries present at the fair. Giving: Handicrafts, jute items, stationery, ornaments, and home decorating, fine and costume jewellery as well as personal accessories and leatherware with 1000 exhibitors. Living: International ideas for the home, avant-garde design, home accessories, items in all styles as well as decorative items for both indoors and outdoors with 1200 exhibitors. With more than 4300 exhibitors from 88 countries it is one of the most international fairs in the world. Also, with more than 130,000 trade visitors from 167 countries the entire world is present at the fair with the top 10 visitor nations after Germany being Italy, China, France, United Kingdom, United States, Netherlands, Spain, Turkey, South Korea and Switzerland. This is a unique chance to interact with the entire world in one location. A number of Sri Lankan manufacturers and buyers look and visit at Ambiente for the growth of their business. Sri Lanka is very rich in handicrafts, ceramic and other decorative items. response quickly to the changing trends and fashion – at Ambiente this can be seen at the various halls, events and presentations. Five (5) exhibitors participated at Ambiente with products from Dankoutwa, Seyln, Gospel House Handicraft, AMP Ceylon and Art Decraotion on display. For example – special presentations, like our “Point of Experience”, the Ambiente Trends, and Solutions. They give you the opportunity to get a quick idea of some important trend developments and learn about some exciting new products. product presentations can attract attention in the digital age. There is also a show called Solutions – now entering its seventh edition – which features solutions to problems through clever everyday products, especially in the dining, kitchen and household segments. A programme that is of equally great importance is the Talents programme. Obviously, the consumer goods industry is an industry based on innovations. To be successful, producers and buyers continually need to look out for new networks, inspiration and ideas. Talents is a vital platform for young designers to meet professionals in the industry. It gives them an opportunity to present their works in the premium halls at Ambiente. Moreover, we at Messe Frankfurt believe in giving back something to the industries we work with. And Talents has proved its worth as a career launchpad for many of our well-known and successful designers. Another interesting feature of Ambiente is the Ethical Style Guide. Now entering its fourth edition, the guide is designed to create transparency. Moreover, the Ethical Style Guide locates all exhibitors with sustainable products and product lines at Ambiente. Sourcing Giving. Frankfurt is thus the number one trading location for volume business outside China. Fascinating presentations and valuable tips: Running on all five days of the trade fair, the Ambiente Academy will provide insights into current market developments. Experts will give presentations in Hall 9.2, showing how to compile attractive product ranges and how to position products in the best possible way. « PRE-OWNED HOME OR A BRAND NEW HOUSE?